Although Leonardo is commonly known as a �universal genius�, the exhibitions dedicated to him have almost always focused on some specific area of his activity: art, anatomy, technology, studies on water, on flight, and so on. 'The Mind of Leonardo' offers its visitors a different point of view, inviting them to explore the genius� very mode of thinking and his unitary conception of knowledge as the effort to assimilate, through bold theoretical syntheses and inventive experiments, the laws that govern all of the wondrous operations of man and nature. 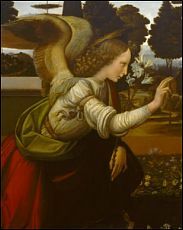 This approach gives rise to a different image, one that helps to dissolve the aura of mystery in which the myth of Leonardo has often been shrouded: a mind tenaciously endeavoring to decipher the rational processes that animate the phenomena of the physical world as well as the �motions of thought�, driven by the desire to achieve a perfect imitation of nature in drawing and painting. The exhibition will show a number of Leonardo�s drawings and paintings (during the first 3 months of the exhibition). Spectacular models of Leonardo�s machines and invention will be also displayed. And multimedia settings will explore the complexity and yet the marvelous unity of Leonardo�s work. Leonardo is probably the best known man of culture of all times. And yet his personality, his deepest motivations, his character and even the image of his face seem to challenge any universally accepted definition. Thus it is fitting that the voyage into the mind of Leonardo proposed by this exhibition should begin with both the severe, penetrating gaze of the Genius� famous self-portrait, and his face seen in profile in the earliest representation in painting. The spectacular �exploded� skull on the Weimar Sheet evokes one of the key concepts of Leonardo�s art-science: the specular relationship between the anatomical structure, on the one hand, and the expression of the motions of the soul, on the other. Leonardo conceives of form as an entity that can be endlessly transformed, according to rules of geometry and proportion that have, to his mind, characteristics of absolute regularity and harmony. He attempts to show the presence of these laws in all spheres of nature: from the human body to those of animals, from the branches of trees to those of rivers, from geometric shapes to those of fossils. This concept of the infinite malleability of forms is a salient feature of his entire activity as artist, designer of machines and investigator of the phenomena of the physical world. 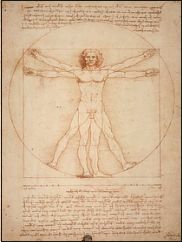 Leonardo studies the proportions of the human body and its commensurability with the perfect geometric forms (the circle and the square). This was scientific analysis that had both cosmological meanings (the correspondence between micro- and macrocosm) and artistic ones (correctly representing the human figure and designing architecture based on the proportions of the human body). In his famous drawing from Venice, Leonardo subjected the Vitruvian Man to a series of original developments. Leonardo's conception of man and nature was quintessentially dynamic. Nature is the theater of incessant phenomena of transformation, governed by the same laws to which mankind and all living organisms are subject. His tendency to bring human emotions too within the framework of a strictly naturalistic approach led to the intense physical analysis of the "moti mentali" that inspired his representations of human features in drawings and paintings. For Leonardo, understanding the causes of motion by systematically investigating its manifestations was the only way to discover the rigorous laws that govern nature. This knowledge is indispensable to the painter who strives to imitate its splendid works. For Leonardo painting is supreme among the sciences, since it is based on the mathematical principles of perspective, it recurs to the verification of experience and is nourished by universal knowledge. The fundamental instrument for the painter is the eye, directly connected to the mind, and thus to the soul. The "science of painting" consists of the process which, through the eyes, passes from nature to the mind and, by means of the hands, from the mind to the painting. Painting is "mental discourse", capable of imitating to perfection all of the natural forms and of endlessly inventing other forms.